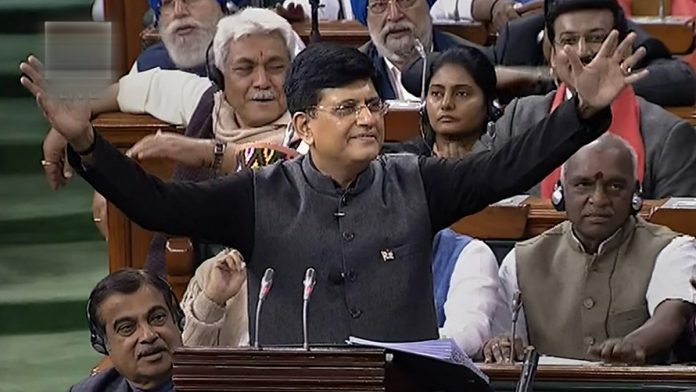 Presenting his first-ever budget, Finance Minister Piyush Goyal steered clear of rhymes, a helpful tool for his predecessors to liven up the speech. New Delhi: Finance Minister Piyush Goyal Friday delivered what his government believes to be a blockbuster election budget, but missing in this mix was the sprinkle of poetic drama his predecessors have been known for. Goyal, in his nearly two-hour-long budget speech, steered clear of reciting poems or verses, even as his dose of entertainment came via the mention of the recently released Hindi movie Uri, based on the 2016 surgical strikes, more than once. His predecessors, however, have been fans of poetry, often garnishing their speeches with popular verses. Arun Jaitley, who is unwell and for whom Goyal is filling in as finance minister, took inspiration from Swami Vivekananda for his 2018-19 budget speech. While he didn’t recite any poem through his long speech, he ended it with a verse from Vivekananda’s Memoirs of European Travel. “You merge yourselves in the void and disappear, and let new India arise in your place. Let her arise — out of the peasants’ cottage, grasping the plough; out of the huts of the fisherman. Let her spring from the grocer’s shop, from beside the oven of the fritter-seller. Let her emanate from the factory, from marts, and from markets. Let her emerge from groves and forests, from hills and mountains,” Jaitley read out. In his previous budget speech, for fiscal year 2017-18, the first after the November 2016 demonetisation exercise, Jaitley chose shaayri to highlight the government’s message on black money. “Nayi duniya hai, naya daur hai, nayi hai umang, Kuch the pahle se tariqe to kuch hain aaj ke rang-dhang. Roshni aake jo andheron se takdai hai, Kaale dhan ko bhi badalna pada aaj apna rang (It’s a new world, a new era and there is new hope. Some things are like before, while some have changed. How light has run into darkness, even black money has had to change colour,” Jaitley recited. A colourful rendition of budget speeches has run right through Jaitley’s tenure as finance minister. In the speech for the 2016-17 budget, the senior BJP leader borrowed a verse to underscore his government’s zeal to fight against the odds. “Kashti chalaane walon ne jab haar kar di patwar hamein, Lehar lehar toofan mile aur mauj mauj manjdhaar hamein. Phir bhi dikhaya hai humne, aur phir yeh dikha denge sabko, In halato mein aata hai daria karna paar humein (When exhausted sailors handed the oar of the boat to us, we found storms and rapids in each wave. But we showed and will continue to show everyone that, even in these conditions, we know how to cross the river,” Jaitley said. “Kuchh to gul khilaye hain, kuchh abhi khilaane hain, Par baagh mein ab bhi kaante kuchh puraane hain (We have made some flowers bloom and there are more we have to, but there are still some old thorns in the garden,” Jaitley said in the 2015-16 budget speech — a poetic jibe at the Congress-led United Progressive Alliance regime. It isn’t, however, just Jaitley who has shown a love for poems to lighten the mood. Consider this: Former finance minister P. Chidambaram used a couplet by Tamil poet Thiruvalluvar in his budget speech for 2013-14. “Kalangathu kanda vinaikkan thulangkathu thookkang kadinthu seyal (A firm resolution must be as firmly carried out without any delay),” Chidambaram recited in a nod to his Tamil roots. While presenting the budget for 2004-05, the then finance minister Jaswant Singh employed poetry too, as did Yashwant Sinha during the 2001-02 budget speech. Singh used Hindi lines — “Garib ke pet mein dana, Grihini ki tukia mein anna (Food in the poor’s stomach, money in the housewife’s purse)” — while Sinha used motivational verse. “Taqaazaa hai waqt kaa ke toofaan se joojho, kahaan tak chaloge kinaare kinaare (It is the call of times to fight storms, how long can we walk carefully)?” Sinha said. Incidentally, both Singh and Sinha — once top BJP leaders who held plum portfolios in the Atal Bihari Vajpayee governments — parted ways with their party after strained equations with the current regime. Perhaps the most significant budget of the country was the one for fiscal year 1991-92, which ushered in the liberalisation of the economy. Presenting the budget, the then finance minister Manmohan Singh, who went on to become Prime Minister, quoted Urdu poet Allama Iqbal. “Yunaan-o-Misr-o-Rom sab mit gaye jahaan se; Ab tak magar hai baaki, naam-o-nishaan hamara (Ancient civilisations of Greece, Egypt and Rome have vanished but our civilisation continues),” he said. Finance ministers of the country have dabbled in poetry to add a dollop of freshness to the dry budget speeches. However, Goyal, known for his “brusque demeanour”, clearly chose to digress from the trend and not bring out his inner poet as he delivered his first-ever budget speech. Dr Singh also quoted Victor Hugo on India being an idea whose time has come, an elemental force of nature. We need more such reformist budgets, which can change the lines Fate has etched on the palms of the humblest Indians.